"What does a guy have to blow to get in trouble at ABC?" Stewart put ABC's Brian Ross in the hot seat for incorrectly linking James Holmes, the Colorado shooting gunman, to Jim Holmes, a member of the Conservative Tea Party. On Monday’s episode of “The Daily Show,” host Jon Stewart unleashed his comedic wrath on ABC’s investigative correspondent Brian Ross for incorrectly identifying James Holmes, the accused Colorado shooting gunman, as a possible member of the Conservative Tea Party. 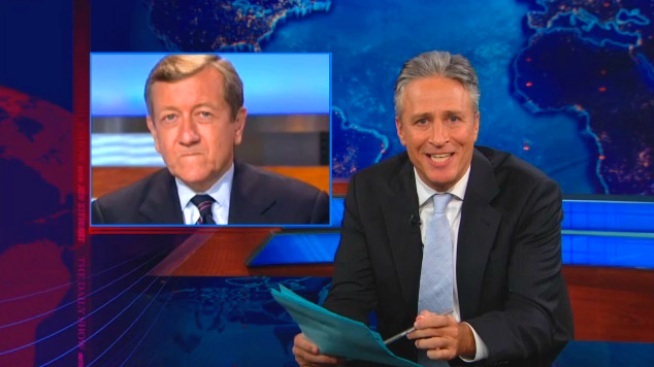 “What does a guy have to blow to get in trouble at ABC?” asked an exasperated Stewart. Speaking about the identity of the gunman, Ross said there was a man named Jim Holmes living in Aurora, Colo. affiliated with the Tea Party. "No harm, no foul, right?" Stewart asked. "Except harm! And this dude isn't even grounded? He doesn't get detention?" Although Stewart acknowledged that news organizations scramble in breaking news moments to inform viewers about the events, that didn't stop him from blasting Ross for not checking his facts and for insinuating that the killer may have been a member of the Tea Party. “What does that have to do with anything?" Stewart demanded. After mocking the investigative correspondent’s office gossip tendency and his penchant for hitting the “I’m feeling lazy button” for his Internet searches, Stewart conceded that Ross did correct the identity of the Colorado gunman, two hours later. The only thing missing, according to Stewart, was an apology. “Really irrevocably sorry to the innocent man that I’ve casually, baselessly and publicly accused of being a, oh, I don’t know, being a mass murderer!” Stewart said. Ross’ penance for his gross oversight, as suggested by Stewart?